Big changes are afoot in how electricity is produced and managed. We’re seeing a shift away from centralized power plants to a new model that features distributed energy — renewable resources, combined heat and power (CHP) and battery storage. And tools like Distributed Energy Resource Management Systems (DERMS) and Virtual Power Plants (VPPs) are aiding in this shift. The drivers include renewable portfolio standards requiring utilities to invest in renewable energy; “prosumers” deciding they want to produce their own energy, go green and save money; and worries about climate change. But utilities and regulators are grappling with the challenges of integrating all this new distributed energy into the old-fashioned grid. Among the many prickly issues are outdated regulations that make it difficult to compensate producers for the energy they bring to the grid. Voltage excursions, brownouts and blackouts are also potential problems. One way for utilities to address the distributed energy resources challenge is by taking advantage of DERMS and VPPs. 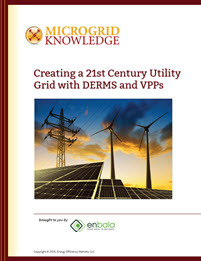 This Microgrid Knowledge Special Report, brought to you by Enbala, identifies distributed energy resource (DER) challenges and explains how DERMS and VPPs address them.